St. Barnabas’ Church, Chester Road DH4 6EU. On A183 Sunderland-Chester-le-Street at junction with Rose Crescent. North wall. Upper of two plaques. 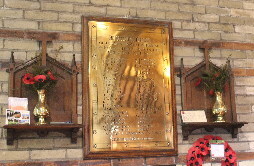 Unveiled 8th November 1921 by the Rt. Hon. the Earl of Durham, KG., GVCO, PC., dedicated by the Lord Bishop of Durham. Plaque set on an oak pattress with fluted edge. The names are listed in two columns. The lettering is in Roman capitals. There is a shelf on each side. who gave their lives in the / Great War 1914-1918. 1. There is a wreath laid by one family each year. 3. According to the D.C.R.O. source, the plaque was made by E.H. Thew. 5. Chester-le-Street Chronicle 18/11/1921 reports unveiling with list of 45 names -does not include G. Lambton or W. Smith. Sunderland Echo 02/11/1923 reports unveiling of William Smith's tablet. There is no tablet in the church to William Smith but G. Lambton's and W. Smith's names are on the plaque on either side of F. Lambton. Were they both added in November 1923? 6. Sunderland Echo 04/12/1933 reports dedication of two vases for the memorial tablet given by Mrs J. Rutter in memory of her husband who was killed in the War. There is no dedication on the vases on view in 2016. Were the two wooden shelves and vases added in 1931? and are these Mrs Rutter's two vases? Chester-le-Street Chronicle 18/11/1921 reports unveiling with list of 45 names. Newcastle Daily Chronicle 02/11/1921 announces unveiling on 8th; 10/11/1921 reports unveiling. Sunderland Echo 09/11/1921 page 4 reports unveiling; 02/11/1923 reports unveiling of William Smith's tablet; 04/12/1931 reports vases dedication. Stanley News 10/11/1921 reports unveiling. "Sleep lightly Lad" Not ascertained.